Reflections and Ruminations: The main ‘problem’ with our Masses may lie in ourselves, rather than in what we see and hear. The main ‘problem’ with our Masses may lie in ourselves, rather than in what we see and hear. There is a common lament that is oft heard, almost ad nauseam, that our Catholic Masses are boring, lame and dreary. Our homilies preached by the clergy, are broad ranging both in topic and in delivery. Whilst some preachers are clearly gifted with the oratory skills of Lacordaire, the renown and highly acclaimed pulpit orator of nineteenth century France, there are far more who struggle to make their weekly homily substantial and engaging, causing many to gripe about the quality of priestly formation and homiletic training. Apart from the preaching of homilies, the other common complaint is that the music, which is an essential part of the Eucharistic celebration, just isn’t ‘engaging’, especially to the generation so used to a daily diet of Spotify and iTunes. While these may be valid comments or complaints made about the way the Eucharist is celebrated, it may be revealing something else – not about the Eucharist, but about ourselves as Catholics. It could be indicating that we are hardly bringing ourselves into the celebration in a real way. Let’s just take a celebration of someone’s birthday for an example. How much love we bring into the celebration very much makes or breaks how good or how uninteresting the celebration is. The more we love the person whose birthday we are celebrating, the less we will allow the externals of the celebration to determine the quality of the celebration. It is not that the externals are not important, but if we do not have much love in our hearts for the person whose life is being celebrated, those tangibles will be the only thing that we will evaluate the event’s significance by. The same would apply, perhaps even more significantly so, where the celebration of the Eucharist is concerned. It is not that good preaching or well-thought out liturgical music are not important. They are, and I am all for homilies that are sound, theological and relatable, with relevant points for reflection. But we may be missing the proverbial forest for the trees if we are only going to Mass to ‘get’ a good homily. What happens at every Mass is a monumental and cosmic event that changed the entire course of history for humankind – God, in the Eucharist, has come to us in the most unimaginable form, in man and in food, to give us something that we could never dream of ourselves – a share in His own Divine life. For this, we need to be ever grateful, which is what Eucharist means – a thanksgiving. One can only be truly thankful if one has love in one’s heart. The more love we have, the more grateful we will be. It’s really as simple or as challenging as that. Besides bringing our love to the Mass, what many miss out in celebrating the Eucharist is the way that they often aren’t bringing their lives to the Mass. The Mass isn’t only about what is joyful and mirthful and delightful. The Mass, because it is really the life of Jesus celebrated, inclusive of those elements of Jesus’ life that are sorrowful, mournful and sad. 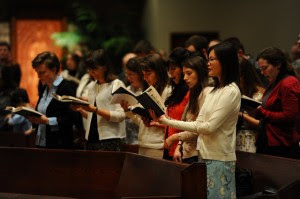 Our connection with what is going on at the Mass is therefore predicated on those similar elements in our lives that we are bringing together with us when we are at Mass. The more we are aware of this, the more the Eucharistic celebration becomes something we can personally identify with. Ronald Rolheiser was astute when he said that “Worship must not just celebrate the heart that people feel they should bring to religious places, but the heart as it beats in ordinary places”. This means that we bring our own experiences of not just joy and gratitude, but also the experiences where we are filled somewhat with what partially paralyses the joys of our hearts. We then stand around the Eucharistic table with the wounds that we share with the other tables of our lives. It requires of us to also be vulnerable before each other and so that there can also be healing. I don't think we are aware of this latter dimension of our worship enough, and that is why we are only critical of what lays at the surface, which comprises what we hear – the preaching and the singing. The next time we find ourselves critical about the liturgy, perhaps it is good to ask ourselves what we have brought to the table of the Lord, and how much love there was on our part.